Cookistry: Gadgets: It's Juice Time! It's amazing how many gadgets there are that are designed specifically for extracting juice from citrus. You'd think we'd have it figured out by now. Apparently not, because in short order I received three citrus tools with different functions and features. And last, we've got an appliance that can extract juice from just about anything. You want juice, I got yer gadget! How many times have you looked at a lemon and thought, "Gee, I wish I could spray lemon juice directly from that lemon"? Yeah, probably not. But wouldn't it be handy if you could? I mean, think about it, you slice a lemon and squeeze it and you get dribbles and drops. What if you wanted a thin layer of juice? Would you brush it on? Or would you pour the liquid into a spray bottle, and then spritz it? That sounds like a lot of trouble. If only there was a better way. 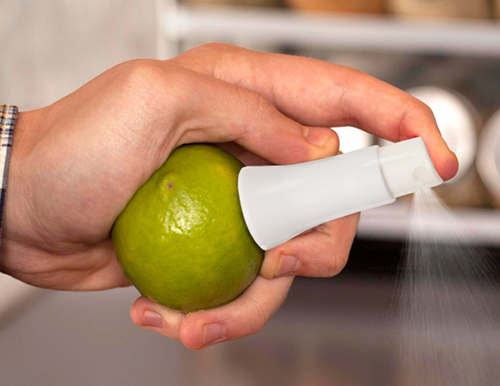 The Stem ($4.99) from Quirky can help you with your citrus-spraying needs. You insert the pump-spray stem into the citrus, then pump the top to spray juice. No need for all that strenuous cutting and squeezing. It actually works pretty well. To get the most juice out of the lemon, it's a good idea to roll the lemon around on the counter before you insert the Stem, and squeeze and massage the lemon a bit when you're not getting as much spray. If you don't use all the juice, you can leave the Stem in the lemon when you refrigerate it. Just make sure the Stem is upright, or the juice will leak out. I have a similar device that adds a pour spout to a lemon, and that works really well when I want a drizzle of juice. Being able to spray the juice is even cooler in a geeky sort of way. I used it to spray lemon juice onto fish before I grilled it, and it added an even layer of juice without making the fish too lemony. It takes a couple lemons worth of practice before you figure out how much to massage the lemon before spritzing. If you massage too much, juice leaks out around the stem. Surprisingly, this gadget is pretty efficient about getting the juice out. After I'd spritzed as much as I wanted to, I cut the lemon in half and squeezed, and there wasn't a whole lot of juice left. Is this a gadget everyone needs? Probably not. But if you have one sitting around in your gadget drawer, I'll bet you'd find times when you'll use it. And then suddenly you'll be spraying lemon, lime, and orange juice on everything, just because it's geeky gadgety cool. But what if you don't want to spray? 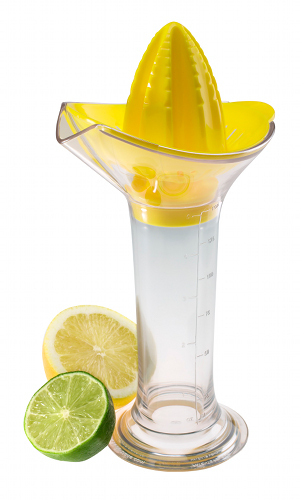 The Fresh Force Lime Juicer (19.99) by Chef'n is similar to the now-familiar hinged squeeze-type juicers. You put the fruit into the juicer with the cut-side down, and squeeze. Juice comes out of the bottom. It's an incredibly simple idea and it works amazingly well. The clue to the difference between this juicer and the standard hinged ones is in the name - it's about the force. This gadget has a ratchety-gear sort of thing that makes it easier to apply force to the fruit. It's a great idea, and it does make squeezing easier. Squeezing juice from one piece of citrus isn't incredibly strenuous, but if you're squeezing a lot of them it's nice to have the job made a little easier. And since you can apply that extra force, chances are that you're going to get more juice out of the fruit. That's a good thing. The other big difference between this squeezer and the ones I have is that mine are made from painted metal. On one of mine, the paint has chipped and on the other two, the paint is discolored. This one is made from a heavy-duty plastic and plated metal, so it seems it will be more durable and stain-resistant. This juicer comes in three difference sizes, for limes, lemons, and oranges, or more accurately, for small, medium, and large citrus. 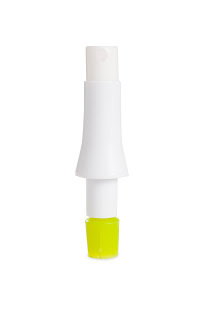 Will I replace old squeezers with these? Probably. Maybe not immediately, but I will replace them eventually and I think the ease of squeeze makes this a better alternative. The JuiceLab by Beaterblade ($17.95) combines an old-style reamer with a convenient way to measure the juice as you go. It's actually a pretty good idea for those times when you need to measure citrus juice rather than squeeze it on to taste. When I saw the first photo of this, I thought it was a cheap gimmick, but it's actually well-made and sturdy. The base has a rubber-like ring on the bottom that keeps it from sliding around, and the base is wide enough to keep it from tilting while you're mashing the fruit on the reamer. There's a reason reamers existed in your grandmother's day and they're still sold now - they work. 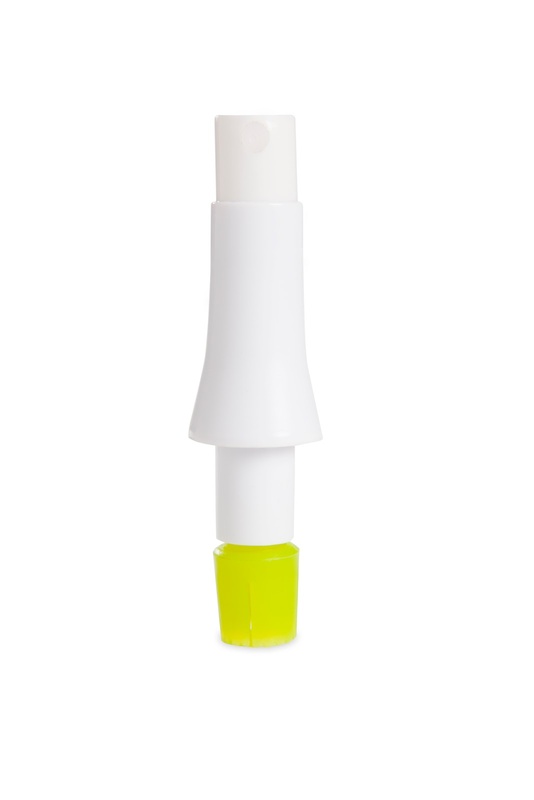 It's a one-size-fits-all tool for most citrus fruits. And if you like pulp in your juice, more enthusiastic reaming will give you more of that pulp. The container works to measure the juice, and you can store the extra as well - there's a plug that fits it securely. It measures up to 5/8 cup, but stores a little less because of the plug. It has markings for ounces, milliliters and fractions of a cup, measured in eighths. I thought it was a little odd that smaller increments weren't marked, and having ounce measures and eighths of a cup was redundant. 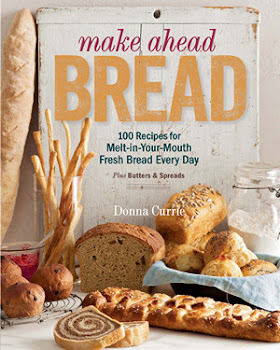 When I first used it, I was looking for tablespoon measures, but once I realized there weren't any, it was easy enough to eyeball half of the ounce markings. The plug (or cap, if you cant to call it that) is actually a tablespoon measure, and has marking for teaspoons. But since citrus can vary in flavor, when we're talking about those amounts, I'm perfectly fine with eyeballing the measures. If I could ask for one improvement - besides those tablespoon marks - it would be to make the measurements easier to read. The marking are raised, but they aren't colored at all, so it took me a while to figure out what I was looking at. Now that I know I'm looking at ounces, I don't really need to read the numbers - they're far enough apart, and there are only five to count on my fingers. So there we go - three different citrus tools - three different purposes. None of them are the perfect solution for every citrus problem, but they've all got their uses. It's easy enough to get juice out of an orange, but when faced with a pineapple or a carrot, the job gets a bit more difficult. That's why electric juicers were created. That, and wheat grass, I guess. The Omega VRT330 is a low-speed juicer - something I knew nothing about until I used this one. 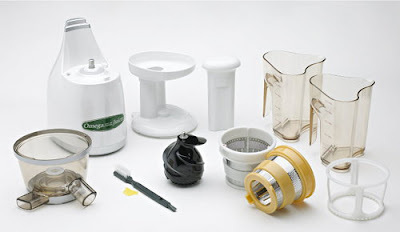 Prior to its arrival, the only electric juicer I ever used was a centrifugal model that basically shredded the fruit or vegetables at high speed, then separated the juice from the pulp by spinning it like a super-fast salad spinner. This juicer has an auger that looks sort of like an old-style orange juice reamer and it spins at a much slower speed than the centrifugal juicers. But the juice extraction wasn't slow. It chewed through fruits and vegetables a lot faster than I expected. It's not terribly noisy, either. It sometimes makes a squeaking sound as the vegetables give up their juice, but it's not as loud as a blender. That's a good thing if you're making fresh juice before everyone is awake. A slow-speed juicer is supposed to be better for the juice because it doesn't produce as much heat. Whether that's true or not, I have no idea. I can tell you, though, that this juicer is efficient. The pulp that came out was pretty darned dry. And if you think there's more juice to be squeezed out, you can toss the pulp back into the juicer to get the last few teaspoons out. The first vegetable to go into the juicer was a carrot. Squeak, squeak, squeak, and there was juice. Celery and some bell pepper quickly met the same fate. Next came pineapple. I didn't juice the edible parts, though. I juiced the core and some other trimmings - not the skin, but some leftover bits from when I trimmed out the eyes. I ended up with a bit more than a cup of juice - not bad for something I would normally have thrown away. I know that juicers are usually about making something that you'll drink as-is, but I found another great use - removing seeds and skin from tomatoes so I could make tomato sauce. Throwing tomatoes into a juicer is a heck of a lot easier than peeling blanched tomatoes, or running the cooked tomatoes through a food mill. I tested the idea with just a few tomatoes, and it worked quite well. This is going to make my fall tomato sauce project a lot easier. I haven't been converted to a juice fanatic yet, but I've used this juicer a lot more than I expected I would. If you think of it as a device to separate fiber-y stuff from juice and pulp, you might come up with more uses for it. For example, when asparagus season is in full swing, I save the trimmings for soup. Cooked down and run through a food mill or strainer to remove all the fibers, those asparagus stems can yield enough soft pulp and juice to make soup. But those stem fibers are tough, and mashing the asparagus ends through a food mill isn't a lot of fun. I used the juicer, and it made the job a LOT easier. Like any gadgety thing, the big question is whether the cleanup time is worth it, and whether there's some other device that can do the same job. When it comes to juicing things like carrots, I can't think of another kitchen tool that could do the job. If you want fresh juice without going to a juice bar or buying bottled product, some sort of electric juicer makes sense. So that leaves the question of cleanup. The big difference between this juicer and the centrifugal juicer I've used is that this one didn't have any sharp parts to worry about, so getting the small bits out of the strainer was much less hazardous. The "attachment parts" are not dishwasher safe, but hand-washing wasn't a big deal. The strainer basket needed a good scrub (a giant toothbrush-like brush was included for this purpose), but the rest of the parts pretty much rinsed clean. Speaking of strainers, there were two included so you can have more or less pulp in your juice. I was provided these products for reviews on Serious Eats.